I’m looking for over the counter asthma inhalers and where it can be purchased. I think I have exercise induced asthma but I don’t want to go to the doctor and I don’t have the money to go either. So I was wondering if I can just use an otc inhaler bought online? I’m 20! If you mean inhalers like Symbicort, Ventolin or Qvar. I think they are all on prescription. The only place where I have ever bought Symbicort over the counter was Dubai. You can use Ventolin. It is the usual otc asthma inhaler for emergencies. My doctor told me that Ventolin nowadays is used for Asthma attacks, because of the immediate effect. However the effect is temporally limited. Because of this, he prescribed Symbicort for me (which by the way is a combination of an anti-inflammatory agent and a beta-blocker and free of cortisone) and Zyrtec/Cetallerg. Asthma can be well controlled by avoiding or managing triggers for asthma and using asthma medicines correctly. Most asthma medicines are inhaled into the lungs, but sometimes tablets, syrups or injections must be used. The four main types of asthma medicines are called relievers, preventers, symptom controllers and combination inhalers. Relievers open airways quickly by relaxing the muscles around air passages. Reliever inhaler devices are blue in color. Relievers include: Airomir, Bricanyl, Asmol and Ventolin inhalers. – Are available from a pharmacist without a prescription. Some people may feel a little shaky and notice a fast heart beat for a short time after using a reliever inhaler. Preventers reduce inflammation in the airways, dry up mucus and make airways less sensitive to asthma triggers. They can prevent asthma symptoms and lung damage if used regularly. Preventers include: Corticosteroids (e.g., Alvesco, Pulmicort, Flixotide and Qvar inhalers), Cromolyns (e.g., Intal and Tilade inhalers) and Leukotriene antagonists (e.g., Singulair tablets). – Will not relieve an asthma attack once it has started. Some people need to use preventers for only a few weeks or months of the year, but other people need to use preventers all year round. Symptom controllers relax muscles around the airways and when used regularly, in combination with a corticosteroid preventer, may improve symptom control. For treating asthma, a symptom controller must always be used with a corticosteroid preventer. Symptom controllers include: Foradile, Oxis and Serevent inhalers). Combination inhalers contain a corticosteroid preventer and a symptom controller in the same inhaler device. To prevent asthma symptoms, they must be used every day, even when you don’t have any symptoms. 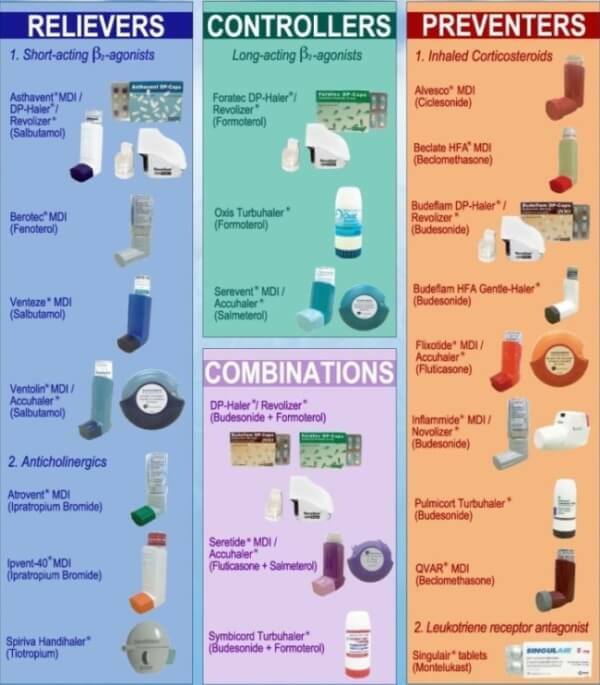 Combination inhalers include: Seretide and Symbicort inhalers. Some people can use the Symbicort combination inhaler as both a preventer and as a fast-acting reliever. Not all pharmacies will sell asthma inhalers without a prescription – and they aren’t all cheap. My son’s inhaler would be about 91$ without a state prescription.